Recommended to: Readers who enjoy mystery stories, especially as written in James Patterson's signature style. 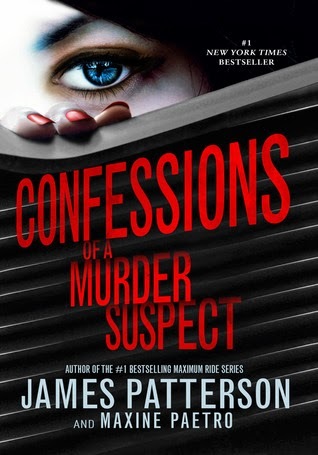 I think it's important to note that this is the first James Patterson book I've ever read. I'd always been told he has a certain "style" with which he writes, but had no clue what that meant. I soon found out. Confessions of Murder Suspect started out confusing, became odder, and then ultimately trapped me in its web. In fact, no matter how lost I felt, I just couldn't stop flipping the pages. It wasn't long before I was fully hooked. This book is like a maze. Confusing at times, entertaining throughout, and unwilling to let you go until you reach the conclusion. The reader is thrown into the lives of Tandy Angel and her family. Tandy is definitely an interesting narrator. She's rather stoic, intelligent, and carries herself as an adult. However you'll often glimpse little pieces of a normal, young girl peeking through. In fact, all of Tandy's brothers are built like that as well. Ranging from intensely athletic, to musically inclined, to full of hot rage, these boys are anything but normal most of the time. Still, there are times where they show their true selves. It takes a while to get used to their antics, but it also really moves the book along. Speaking of time, it actually takes a bit to understand the Angel family in general. James Patterson builds up the family back story, and the setting, in little, jumbled pieces. I would be learning about the extraordinary furniture in the Angel household, and suddenly find out that Tandy had holes in her memory. Then I'd be intrigued by the family's reward and consequences system, only to randomly discover that one of her brothers may be a psychopath. Needless to say, this book is all over the place. Like I said above though, it's tough to look away. There's something bewitching about all the madness. It creates a need to know how it's all going to end. Which is why, by the time I reached the end of Confessions of a Murder Suspect, I was a mess. I'd finally discovered some mysteries, but then there was so much left unanswered! As the first in a series, I'll be forgiving. I can't deny that I'm anxious for book two though. This wasn't a passive read. I was thinking, and piecing things together the entire time. It kept my attention riveted and any book that can do that is a keeper in my eyes. It might feel like a maze, but it's one worth navigating.